Prime Design's all aluminum AluRack cargo carrier provides support for loads, long or short, up to 300 lbs. with five heavy duty reinforced extruded cross supports. Prime Design's all aluminum AluRack cargo carrier provides support for loads, long or short, up to 300 lbs. with five heavy duty reinforced extruded cross supports. Full-length side rails made of .080 thick aluminum tube help protect cargo and keep it on the rack. For convenience add a quick clamp upgrade to either the street or curbside of the rack. Each upgrade includes a gas strut assisted hold down that keeps your ladder secure and in place. A quick turn of the handle releases the clamp and your ladder can be easily removed. A padlock (not included) can be applied to the handle to help prevent unwanted removal. Rack mounts in a full length aluminum channel that attaches to the vehicle utilizing factory mounting points. 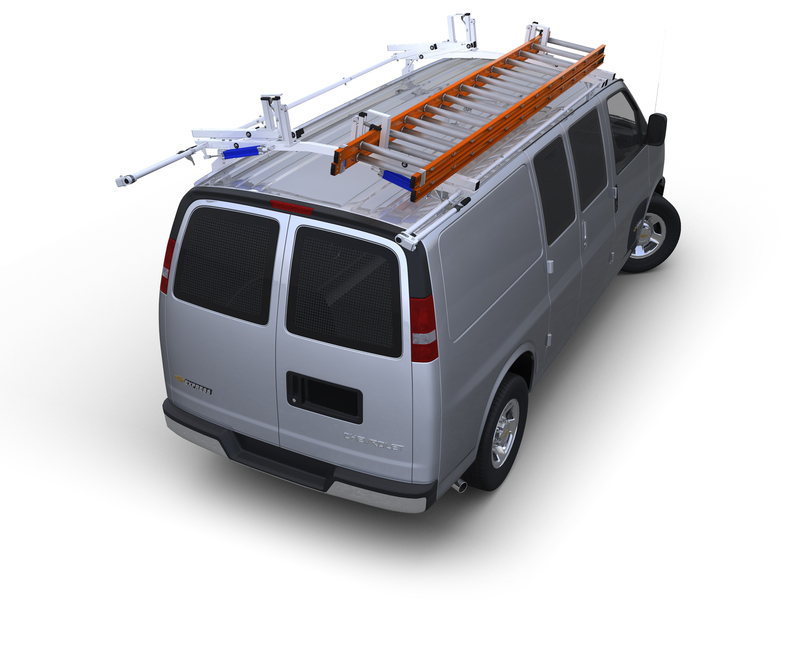 Racks which are fully anodized, come complete with stainless steel hardware and mount using a supplied mounting channel that attaches to the roof of the van into existing threaded holes in the roof provided by the manufacturer.